As an Animal Biologist, when the mind behind Genetics and Beyond proposed me to divulge some curious aspects and facts of the wildlife, I rapidly agreed. Although all the animals are wonders of nature, I have chosen the puffin to inaugurate this blog section. The Atlantic puffin (Fratercula arctica) is a black and white seabird with reddish legs that presents a shiny colourful beak during mating season – the couple remains together for a lifetime. It can be mainly found in northern coast of Europe, Iceland and Faroe Islands, and lives in colonies near the cliffs, ready to dive and get some squids and seafood. However, what it likes the most is fish. And here it comes the amazing feature. If you have seen a bird diving for fish, they usually take out from the water one fish. The Atlantic puffin can catch and hold with ease about 10, each trip. 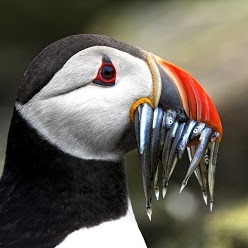 The puffin’s tongue is special, as is shown in the picture. It uses its raspy tongue to push the fish against spines on the palate while they continue fishing. Each time another fish is caught; the tongue pushes again and holds it up with the others. About its status, it is not endangered but a well coastal management is required for the puffinus welfare. In UK some nesting areas are protected by the law. Puffin is vulnerable to black rat plagues, massive hunting and anthropogenic disturbances in its environment. Iceland is the only country in the world where the puffin can be hunted legally – only from September to May – and its meat, often served smoked, is an ingredient of the Icelandic traditional gastronomy.